Galileo just introduced a new step up for it’s very successful Milano Grand. The new Milano3G offers not only a new look with both cabinetry and an all new bigger display, but enhanced sound and amplification as well. With the Milano3G full featured specifications including the built in iPod Dock that can add an incredible entertainment addition, you cannot find another digital grand that is so featured packed. The new Milano3G, a new look, new sound and affordable pricing and available now in three new finishes, high polished ebony, beautiful mahogany and high polished white. The Milano3G with larger display combines advanced piano technologies and ensemble features – in a beautifully designed “mini grand” cabinet – at an ultra-affordable price! Designed to meet the high standards of European tradition, the Milano3G combines beauty and performance in an entertaining instrument that is perfect for your home. 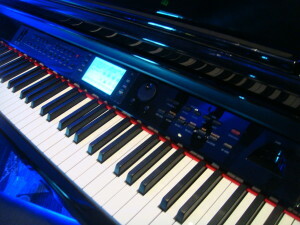 The Milano3G is loaded with features including a palette of over 138 built-in sounds and 100 different rhythm styles. You can add ‘intros’, ‘endings’ and ‘fills’ as well as record your own compositions on the built-in Multi-track sequencer. The graded-hammer action keyboard simulates the mechanics of an acoustic piano to help develop finger agility. There’s a USB connection & SD Card drive for recording and playback as well as a convenient iPod® Dock (for audio playback)! All functions are easily displayed in a large back-lit LCD display screen. The beautiful designed ebony polish cabinet features elegant piano styling, lifting piano lid with silver-plated pedals and hardware – and includes a matching piano bench. The Milano3G by Galileo – a blend of beauty and features at an affordable price!